Decompiling Flash files is now easier than you can imagine! 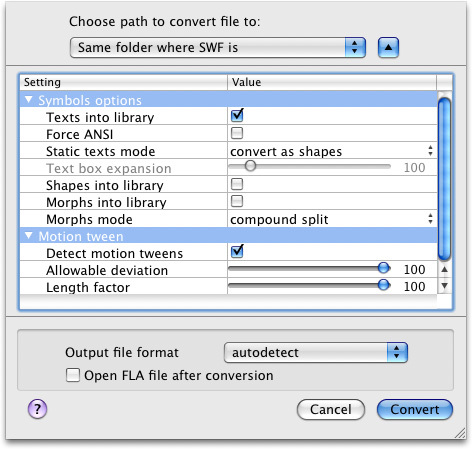 You can simply modify or completely re-do your SWF movie even if you have lost the original FLA file or Flex project. From now on you can even process several of your SWF files at the same moment. SWF Decompiler Mac is powerful enough to support Adobe Flash versions from Flash 5 to Flash CC. It's compatible with Mac OS X 10.5 - 10.11 (El Capitan). Flash Decompiler supports Adobe Flash Professional CS6 and CC and conversion of SWF files with a standard Flash preloader (e.g. files with TLF texts)! With Flash Decompiler Trillix for Mac you can turn any of your SWF movies into their source FLA or Flex file. SWF to FLA converting has never been easier! Simply choose the file you need to convert and click the Convert button. Ta-dah! You have the source code with all ActionScripts on your hard drive. Now all the SWF files are ready to be edited any way you want. 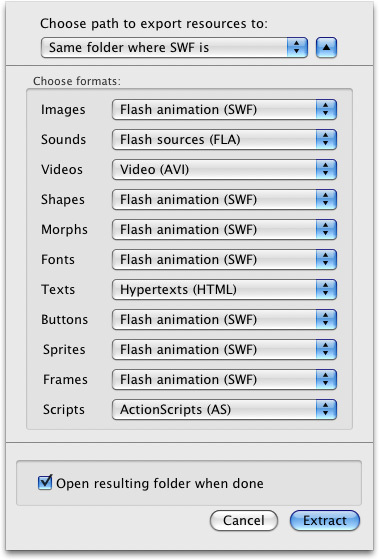 SWF Decompiler for Mac will show you everything Flash movie is made of. You can easily split a Flash movie into its elements and save every one of them in various formats for further editing and using for your own needs. Please be aware that Single License can be used for personal or commercial use and may be installed on only one operating system.